Home / ancient / history / Makeup / The History of Makeup !! The History of Makeup !! Are not we? We wear makeup to feel beautiful, but do we know its history? No? Let's have a toll to it. We wear it to feel beautiful, to express our creativity and to showcase our personality on the most personal and visible canvas that we have, but what is the history of makeup? How did it come to be that women all over the world use makeup daily? The way in which makeup is used has changed dramatically over the years. For example, where women used to use all sorts of natural potions to lighten their skin, today women spend hundreds of dollars in order to appear tanned without subjecting themselves to harsh UV rays. It has been said that the history of makeup began in Egypt and Greece where people used castor oil to protect their skin from harsh weather. Kohl and henna were used in Egypt and people used natural products from the earth in order to protect themselves from the elements and take care of their skin. Many of the products used are still active ingredients in beauty products today like beeswax and herbs. In the Middle East, earthly products were primarily used to concoct perfumes and incense, as cosmetics were fundamentally seen as somewhat medicinal. In China around 3000 BCE, people began to use gelatin and beeswax to color their fingernails to exhibit their social status. In Japan, geisha's used specific flower petals to paint their lips and eyebrows and natural ingredients to whiten their faces, just like the geisha that are still around today. Europe’s makeup history isn't as liberal, since the church didn't permit makeup. Not all women listened of course. Since women working outside had their skin naturally darkened by the sunlight, women in the upper classes wanted to appear as white as possible, so as not to have their social status mistaken, and therefore used powders to cosmetically lighten their skin. The theater and American films are what really brought makeup and its uses to what it is today. As cosmetic companies, primarily in the United States, began marketing their products with advertisements and celebrity spokeswomen, makeup began to become popularized. Women in the 1920’s wore bright coloured makeup and painted their nails. The 1970's and the advent of feminism saw some women shunning makeup and so began cosmetic ranges that were touted as providing a more “natural” look for women who wanted to wear makeup but not look like they were wearing makeup. Today, you can’t enter a shopping mall or stroll along a high street without stumbling upon a makeup store. With the advent of eCommerce, you can purchase makeup on thousands of websites in a range of colors and styles with only a few clicks. 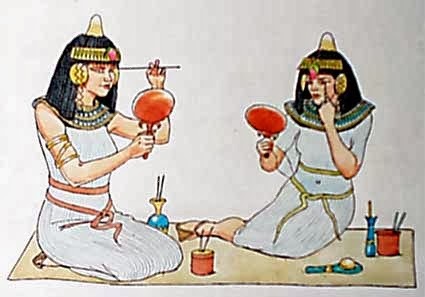 Makeup has come a long way from its early days in Egypt. 29 comments on "The History of Makeup !!" Great post :) so much we don't know about makeup. Great post! A lot that we don't know about makeup. 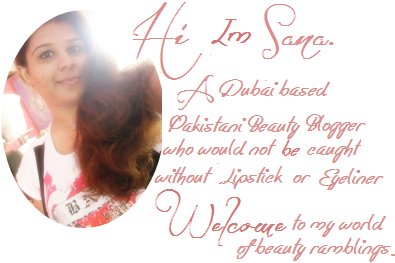 Thank you, Sana! very fascinating to read.. I knew some of the old concoctions, but had no idea how far back and extreme it went. I guess women have always been vain and in need of feeling more beautiful :) I do remember well, the 70's where it seemed everyone had a line of "10 easy steps to the more natural-looking you" Ha! I think we've come a long way! Great Blog! I'm your newest follower! I love this history! I never really knew how long makeup has been around! That is interesting! It's funny how it never occured to me to find out the history behind make up! Thanks!! Yes, the first civilization discovered this item through Cleopatra, as far as the written record. Nice and informative post. Cool. I've learned a lot from your post. It's make sense that they developed make up from the need to protect the skin. This is a nice bit of history thanks for sharing! Learning about the history of makeup is so fascinating! It's a definite passion aside from makeup itself. I love how far back the use of makeup extends. Really informative and fascinating. I think of Cleopatra when I think of Egypt and make-up! I don't know the full history of makeup, all I know is that it started with Cleopatra. Thanks for sharing this! Interesting post! It definitely reminds me of Cleopatra who never grow old! Thanks for sharing and it's really interesting! Never knew how make up started up with this :D! wow interesting story dear...i was thinking about this the other day...you totally answer all my question...and Im a makeup junkie..they are so fun! So many facts I didn't know about. Who doesn't love a bit of history ;) I enjoyed reading this. interesting post with a lil bit knowledge inside the article..